Nursultan Nazarbayev, who prides himself on leading the most advanced and democratic country in Central Asia, may have just become president for life. The Kazakh parliament voted overwhelmingly to allow Mr Nazarbayev to run for office as many times as he likes. 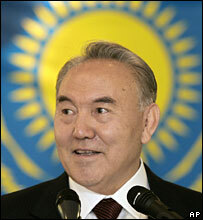 Mr Nazarbayev is not the first Central Asian leader to gain the option of life-long presidency. 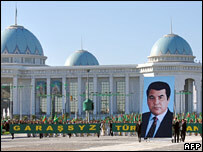 In Turkmenistan, Saparmurat Niyazov was president for life, until he died in 2006. But few expected Mr Nazarbayev, who is Washington's closest ally in the region and the man in charge of the former Soviet Union's fastest growing economy, to follow in the footsteps of Turkmenistan's eccentric dictator. Mr Nazarbayev, 66, has ruled this nation of fifteen million for 17 years. The result has been a booming economy, fuelled by billions of dollars worth of Western investment, and a standard of living much higher then elsewhere in the region. But in Kazakhstan political development has been lagging far behind the country's impressive economic growth. Mr Nazarbayev's family is accused of controlling much of the country's business, no election here has ever lived up to international standards, most of the media is tightly controlled by the state and two leading opposition politicians have been murdered here in the last year and a half. Still Mr Nazarbayev has always insisted that democracy was his goal. He has also been ambitious about turning Kazakhstan into a serious international player and is very sensitive about his country's image overseas. With plenty of oil cash to spare, the government has been buying space in international newspapers and air-time on television channels, and promoting Kazakhstan as an island of stability and prosperity. But Mr Nazarbayev's critics have long said that genuine political reform is what is really needed to boost the country's image. For months now many of them have been waiting for constitutional changes that the president said would give more power to the parliament and make the country more democratic. A much more powerful president is what they got instead. The new constitution increased the number of the legislators and cut the length of the presidential term from seven to five years, but these changes are overshadowed by a generous exemption the law makes for Mr Nazarbayev himself. The MPs said as a founder of the modern Kazakh state, Mr Nazarbayev should be able to take part in the elections after his term expires in 2012. "The government just spat into our faces," said Yevgeny Zhovtis, Kazakhstan-based analyst and human rights defender "It's sad, it's disappointing, and it shows that they are creating an increasingly authoritarian system." The impact of the Kazakh decision spreads far beyond the country's borders. Across much of the former Soviet Union, and especially in Central Asia, succession is a serious political issue. Over the past two decades, the former communist bosses in charge of this energy-rich region have built systems based on clans and powerful elites. And as the elites got richer in each Central Asian country, observers saw governments rig one election after another, close down opposition parties, shut down independent media and tighten the grip on freedom. Having long exhausted their tolerance for dissent, Central Asian presidents did not groom obvious successors, but concentrated on holding on to power instead. In Uzbekistan, President Islam Karimov has been ignoring the issue of the next presidential elections, despite the fact that according to one reading of the law his term has already expired. In Tajikistan, Immomali Rakhmon has recently changed the constitution to allow him to run for the third term. But it was Mr Nazarbayev who invented what seems to be a perfect, constitutional solution to staying in power. And he is likely to have created a precedent too. As Central Asia's ageing leaders watched him cement his position they are likely to have felt inspired by his example. "The rule of personality has just won over the rule of law," said Yevgeny Zhovtis. "And this is a huge blow to the young, fragile democracies like in Kyrgyzstan or Georgia and a huge boost to the totalitarian governments in places like Belarus or Uzbekistan," Mr Zhovtis said.